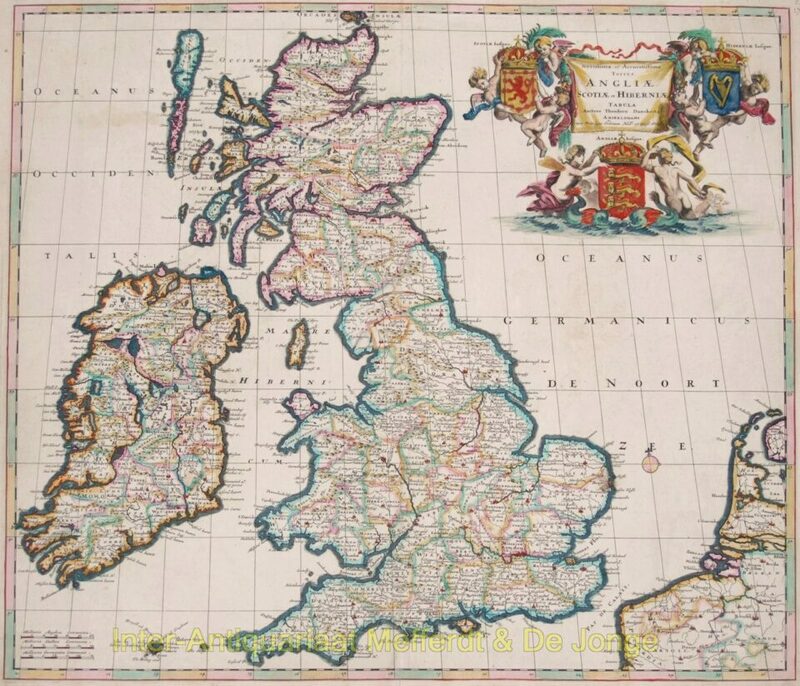 Attractive map of Great Britain and Ireland published by Theodorus Danckerts in Amsterdam 1687. Elaborately decorated cartouche with coats of arms of Ireland, Scotland and England. Verso: blank. Original hand colouring. Size: 50,9 x 59,0 cm. The Danckerts family were notable print and map sellers, and engravers in Amsterdam for nearly a hundred years, between 1630 and 1727. Between 1680 and 1700, Justus an his three sons Cornelis, Theodorus, Justus II published several editions of their Danckerts Atlas. Justus Danckerts was probably ranked the highest of the skilled engravers of the seventeenth centry. His maps were in demand for the wonderful decorative quality of their engraving rather than for their accuracy. Reinier and Joshua Ottens later acquired the stock of plates from the family and reissued the maps, replacing Danckerts’ names with their own.